There are a number of startups in which you can sign up to receive things via snail mail but Quarterly Co. is hoping to set itself apart by sending its members original items selected by a participating curator who you select when signing up for the service. The contributors include New Yorker writer Sasha Frere-Jones, the Hasso Plattner Institute of Design, RISD president John Maeda, and Geoff Manaugh. 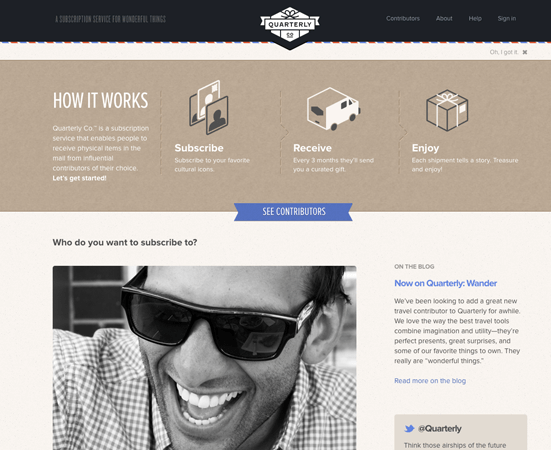 In April of this year the Los Angeles startup reported raising $1.25 million and its founder Zach Frechette, former editor of GOOD Magazine, hopes to capitalize on the sense of joy when receiving things in the mail. Eventually, Frechette sees the possibility of members being able to suggest contributors. A native of Boston, Frechette went to Brown University and then got a job in advertising before moving to Los Angeles to become editor of GOOD Magazine. The founder of GOOD was someone Frechette had known in high school and it was after a phone call with the founder inviting him to be part of a young and dynamic team based out of L.A., that Frechette decided he would move to the west coast. 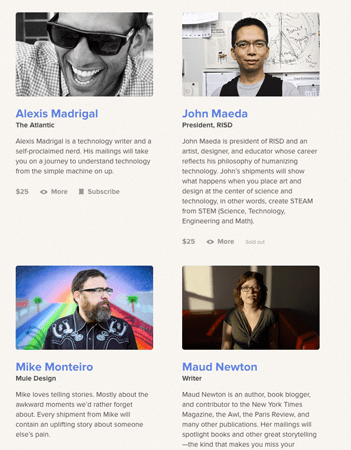 GOOD magazine looked to set it itself by being an internet startup that would send its members a printed magazine. 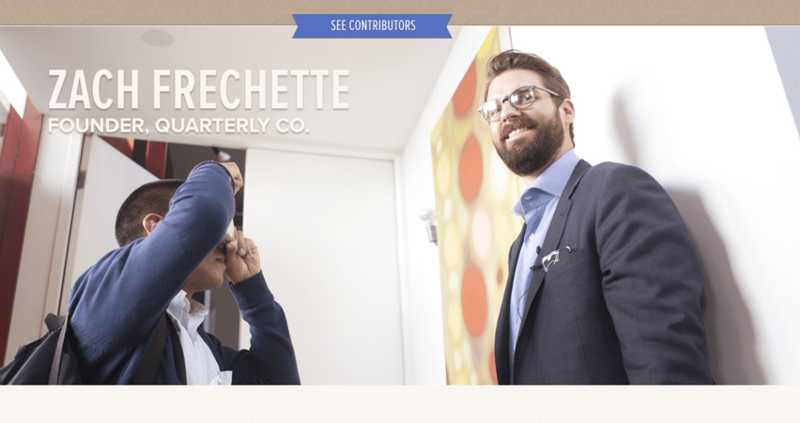 Frechette’s Quarterly Co. has a similar idea except that instead of sending members an actual printed magazine, subscribed members receive objects in the mail. Part of Frechette’s thinking behind Quarterly Co. has to do with a childhood memory of his from his days at summer camp. He recalls the time when his mother began skillfully hiding candy she would send him while at camp in a deck of cards, a bottle of aspirin, or inside of teddy-bear (yes, they were gummy bears). Garry Tan of Y Combinator and Alexis Ohanian agree and have donated towards the southern California based startup. Launching a startup is of course risky, but Frechette like many founders, wouldn’t have it any other way. He notes that there’s certainly the more traditional way of pursuing one’s interest and finding a job that works in that industry. However, Frechette believes that pursuing something that’s a little less “comfortable” or easy can also payoff. He adds that things may be uncomfortable at first, but with that risk things can actually work out and this may not what most people concentrate on when taking the risk. It seems he’s more interested in trying instead of worrying so much about the failure. It’s a healthy attitude to have as a founder and it’s definitely a characteristic the founders that I’ve interviewed for KillerStartups have all exhibited. The idea for the founders I’ve spoken to is that there are other opportunities available if you’re willing to look for them and work for them, but if you’re truly interested in doing something that you think will make a difference in people’s lives, then you should seriously consider putting it all on the line towards that idea. Who knows, it might now work out for you although if it does end up working out for you, then it could be exactly what you wanted to do as your job for the rest of your life, and that’s a wonderful thing.